LOVE is in the BLOOD - Urban Fantasy Graphic Novel / webcomic » Page: 2 LOVE is in the BLOOD – Urban Fantasy Graphic Novel / webcomic – Page 2 – New action-romance comic book tales of the first vampire. Want to know more about new Love is in the Blood artist, Marvin Mann? Check out this profile at the Charlton Neo blog. 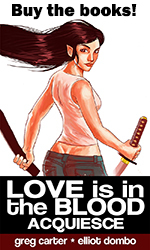 Love is in the Blood is now in the free Comic Chameleon iPhone app. 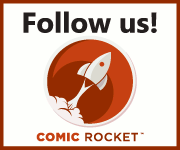 If you have an iPhone you can now easily read many popular webcomics in their app. It’s pretty cool – it has a guided view for panel-by-panel close-up reading. Get info HERE or search for it in the App Store. My daughter Claire and I will be at the UpDown Studio booth in the Dragon Con Comics and Pop Artist Alley August 29 – September 1, 2014. She will have a lot of groovy pop-art stuff (check out her Etsy). I’ll be bringing the comics, Love is in the Blood: Acquiesce graphic novel; a special combo issue of Love is in the Blood: Begin Again #1 and #2; the brand new Perfect Agent Greatest Hits Vol 1 graphic novel; and more. We will have some of my wife’s amigurumi too. We are at Table 83, which in the back corner to the right. We should be easy to find – look for the big UpDown Studio/Greg Carter banner on the front of the table.